Saw my name and started looking around for my pie! Just kidding. I hope you love the site as much as I do. It’s really helping in a lot of strange but wonderful ways. happy new year to you and your wonderful family. I just read a few of your posts… what a blast it must have been to see Sir Paul! We saw him in Portland, Oregon a few years back and I agree he is worth the ticket price! What a great time we had. Thank you for your kinds words… this gifting of a pie has become an amazing journey. One that I could not have predicted. I wonder how did you “discover” me? I would love to know how the dots connected. Thank you for following my blog. And I like the idea of “one french word” and will try and follow along as well. Happy New Year to you too! Peggy, I was really so delighted to give you a pie and was grateful to Ellen for the recommendation. 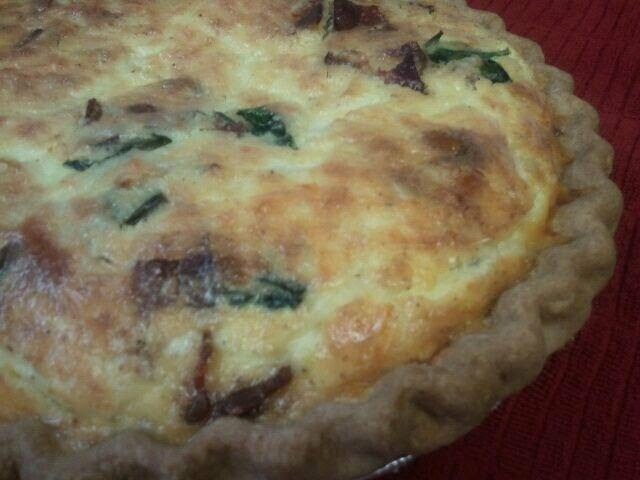 I am glad you liked it… I love quiche too… and most things with bacon! Sometimes I am not sure how folks feel about receiving a pie, but your smile seemed to fill the room, and there was no doubt that you were pleased. I send you happy wishes for the new year.